The mysteries regarding the origin of the king of the planets, Jupiter, could be solved by NASA's Juno mission blasting off toward the gas giant on Friday (Aug. 5). Jupiter is the largest of the solar system's planets, containing more than twice the amount of matter as all of the other planets combined. The primary goal of the Juno mission is to understand how Jupiter formed and evolved. 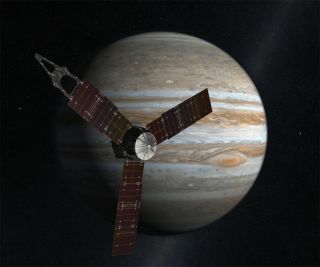 "Jupiter was likely the first planet to form, and by learning more about the earliest steps in the history of the solar system, we learn about our history too," Scott Bolton, principal investigator for the Juno mission and director of space science and engineering at the Southwestern Research Institute in San Antonio, told SPACE.com. "By going back to square one with Jupiter, we get to understand how we got here." "Understanding how giant planets in general work is very important — if Jupiter is any example, then they likely play a big part in how the rest of their solar systems look," Bolton said. For instance, evidence suggests that Jupiter and Saturn helped sling around other planets in the solar system. Jupiter, like the sun, is made up of mostly of hydrogen and helium, suggesting it formed early, capturing most of the material left over after our star was born. However, how this happened is unclear. Did a massive planetary core arise first that gravitationally captured all that gas, or did an unstable region collapse in the disk of gas and dust around the sun, triggering the planet's formation? After finishing its five-year cruise to Jupiter, Juno will map its magnetic and gravitational fields to reveal the planet's interior structure. "If we detect a solid core of heavy elements in Jupiter, that would imply in many people's models that the core developed in the early solar system before the rest of Jupiter formed, which then sucked in the rest of its gas and dust," Bolton said. "If we don't see that, it might favor the model of instability in the disk around the early sun." Just as critically, Juno will scan how much water Jupiter has as part of its mapping of the planet's atmospheric composition, temperature and cloud motions down to unprecedented depths. This data will reveal how many icy proto-planets Jupiter absorbed during its evolution, shedding light on how water and organic compounds made their way around the early solar system — including Earth. "There's much we do not know about how we got the elements we did or how the Earth got its ocean," Bolton said. Juno will also investigate Jupiter's magnetic field, the most powerful of any planet in the solar system. Scientists think this is generated deep inside the planet's atmosphere, where hydrogen gas is squeezed under great pressure into an electrically conducting material fluid known as metallic hydrogen. As the planet spins, it acts like a mighty engine or dynamo to generate its extraordinary magnetic field. The Juno spacecraft, folded up and awaiting encapsulation in the rocket fairing. The 13-foot-long magnetometer boom, wrapped in bright thermal blankets, is in the foreground atop a stack of folded solar arrays. One of the twin magnetometers is mounted in the middle of the boom, and the other is mounted at the outermost end. Next to each magnetometer sensor is a pair of rectangular hoods, or light baffles, peeking out from under the thermal blankets; these define the fields of view for the two star cameras, which determine the orientation of each magnetometer sensor with great accuracy. To analyze Jupiter's magnetosphere, Juno will pass repeatedly just above the planet's surface to directly sample its charged particles and magnetic fields. To do so, the probe has titanium walls to shield the spacecraft's electronics from Jupiter's radiation. "It's like an armored tank going in there," Bolton said. In addition, Juno will approach Jupiter's poles to investigate the brightest auroras in the solar system, potentially greatly improving our understanding of these light shows. "The auroras on Jupiter are very different than those we see on Earth," Bolton said. "The ones on Earth are governed by the solar wind interacting with Earth's magnetic field, while on Jupiter it's internally driven — you have this massive magnetic field holding all these charged particles that are driving the auroras."